During a press event at the 33rd Space Symposium, Boeing unveiled their concepts for their deep space gateway and transport systems. These systems will assist NASA in the agency's goal to develop human space exploration from the Moon to Mars. Boeing is helping to develop the Space Launch System, a NASA project, which will deliver a habitat to cislunar space close to the Moon. 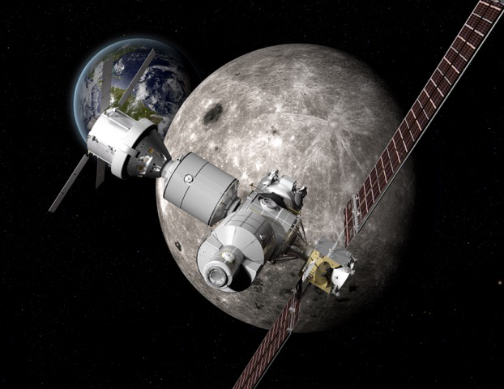 This is called the Deep Space Gateway and the habitat is being designed to support crucial research as well as to open opportunities for governments or commercial entities through partnerships in deep space, to include lunar missions. The mission hardware would be powered by the SEP (Solar Electric Propulsion) system. Artistic rendition of the Deep Space Gateway. The Deep Space Gateway could, according to the Boeing spokespersons, be the way point for upcoming Mars missions. The docking system to be used would be similar to what is being used on the International Space Station for various operations and could also host the Deep Space Transport vehicle. The latter would take manned flights to Mars and would be equipped with a habitat that could protect the passengers from the hostile environments of space as well as the spacecraft's bus. These concepts from Boeing leverage what they have learned from the firm's 702 satellite family solar electric propulsion technologies. The gateway and transport systems are partially being developed as part of NASA's Next Space Tehnologies for Exploration Technologies — know as the Next Step program — and an ongoing SEP technology development effort with the NASA Space Technology Mission Directorate (STMD).